Education: Diploma of French Language and Civilization, University of Paris/Sorbonne, 1987. Bachelor of Arts, Brigham Young University, 1989. Master of Arts, American University, 1990. Juris Doctorate, University of Oklahoma, 1993. Legal Experience: Admitted to practice law before all Arizona Trial and Appellate Courts, 1993. City Prosecutor, City of Bullhead City, 1994-1996. Deputy County Attorney, Maricopa County, 1996-2002. Deputy County Attorney, Pinal County, 2002-2008. Pinal County Felony Prosecutor of the Year, 2003. Private practice, 2008 - 2010. Judge Pro Tem, Pinal County, 2008-2010. 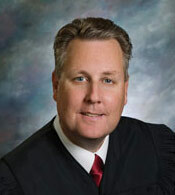 Elected by the people of Pinal County to the Superior Court on November 2, 2010. Community Involvement, Past and Present: Board of Directors, Copper Basin YMCA; Member, Rotary International; Youth Basketball Coach, YMCA; Counselor, Boy Scouts of America.